The installation will be taken care of promptly using proven technology to maximize your long-term financial benefits. You’ve got plenty of options when it comes to solar, and your expectations are understandably high. With over a decade of experience, we’ve learned exactly what homeowners and businesses need to take advantage of cheap, renewable energy without it becoming a chore. When you buy a brand new car, you don’t expect to have to become a certified mechanic for your car’s make and model. We believe it should be the same with your solar system. We won’t only custom-design a solution that fits your specific needs; we’ll also be constantly monitoring your system’s output to ensure maximum performance for years to come. Should your solar system require attention, our experts will handle it so you don’t have to. In order to take full advantage of solar energy for your home, you should be getting your Solar Renewable Energy Credits (SRECs). Those reimbursements are your reward for creating re-newable green energy. 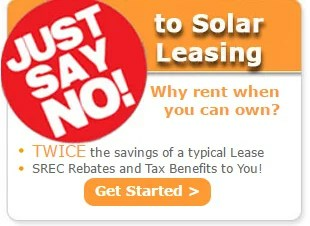 Why let a leasing company make tens of thousands of dollars off your home solar system? 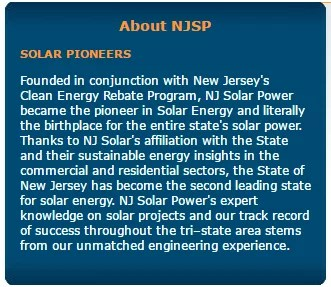 While some of the big solar companies want their customers to enter into complicated lease agreements that allow companies to keep the Certificates for themselves, NJ Solar Power wants you to keep what you earn for generating renewable energy. Also, there is a 30% federal tax credit for solar. Simply put, if you pay federal taxes, leasing is the wrong way to go!